Hint: It’s not looking good. As this endless election limps toward its last days, while spiraling into a bizarre duel over vote-rigging accusations, a deep sigh is undoubtedly in order. The entire process has been an emotionally draining, frustration-inducing, rage-inflaming spectacle of repellent form over shallow substance. For many, the third debate evoked fatigue. More worrying, there was again no discussion of how to prevent another financial crisis, an ominous possibility in the next presidency, whether Donald Trump or Hillary Clinton enters the Oval Office—given that nothing fundamental has been altered when it comes to Wall Street’s practices and predation. At the heart of American political consciousness right now lies a soul-crushing reality for millions of distraught Americans: The choices for president couldn’t be feebler or more disappointing. On the one hand, we have a petulant, vocabulary-challenged man-boar of a billionaire, who hasn’t paid his taxes, has regularly left those supporting him holding the bag, and seems like a ludicrous composite of every bad trait in every bad date any woman has ever had. On the other hand, we’re offered a walking photo-op for and well-paid speechmaker to Wall-Street CEOs, a one-woman money-raising machine from the 1 percent of the 1 percent, who, despite a folksiness that couldn’t look more rehearsed, has methodically outplayed her opponent. With less than two weeks to go before E-day—despite the Trumptilian upheaval of the last year—the high probability of a Clinton win means the establishment remains intact. When we awaken on November 9, it will undoubtedly be dawn in Hillary Clinton’s America, and that potentially means four years of an economic dystopia that will (as would Donald Trump’s version of the same) leave many Americans rightfully anxious about their economic futures. None of the three presidential debates suggested that either candidate would have the ability (or desire) to confront Wall Street from the Oval Office. In the second and third debates, in case you missed them, Hillary didn’t even mention the Glass-Steagall Act, “too big to fail,” or Wall Street—while in the first debate, the subject of Wall Street came up only after she disparaged the tax policies of “Trumped-up, trickle down economics” (or, as I like to call it, the Trumpledown economics of giving tax and financial benefits to the rich and to corporations). In this election, Hillary has crafted her talking points regarding the causes of the last financial crisis as weapons against Trump, but they hardly begin to tell the real story of what happened to the American economy. The meltdown of 2007–08 was not mainly due to “tax policies that slashed taxes on the wealthy” or a “failure to invest in the middle class,” two subjects she has repeatedly highlighted to slam the Republicans and their candidate. It was a byproduct of the destruction of the regulations that opened the way for the framework that allowed “too big to fail” to thrive. Under the presidency of Bill Clinton, Glass-Steagall, the Depression-era act that once separated people’s bank deposits and loans from any kind of risky bets or other similar actions in which banks might engage, was repealed with the Financial Modernization Act of 1999. In addition, the Commodity Futures Modernization Act was passed, which allowed Wall Street to concoct devastating unregulated side bets on what became the subprime crisis. Given that the people involved with those choices are still around and some are still advising (or, in the case of one former president, living with) Hillary Clinton, it’s reasonable to imagine that in January 2017 she’ll launch the third term of Bill Clinton when it comes to financial policy, banks, and the economy. Only now, the stakes are even higher, the banks larger, and their impunity still remarkably unchallenged. Consider President Obama’s current treasury secretary, Jack Lew. It was Hillary who hit the Clinton Rolodex to bring him back to Washington. Lew first entered Bill Clinton’s White House in 1993 as special assistant to the president. Between his stints working for Clinton and Obama, he made his way into the private sector and eventually to Wall Street—as so many of his predecessors had done and successors would do. He scored a leadership role with Citigroup during the time that Bill Clinton’s former Treasury secretary(and former Goldman Sachs co-Chairman) Robert Rubin was on its board of directors. In 2009, Hillary selected him to be her deputy secretary of state. Lew is hardly the only example of the busy revolving door to power that led from the Clinton administration to the Obama administration via Wall Street (or activities connected to it). Bill Clinton’s Treasury under secretary for international affairs, Timothy Geithner, worked with Robert Rubin, later championed Wall Street as president and CEO of the New York Federal Reserve while Hillary was a senator from New York (representing Wall Street), and then became Obama’s first Treasury secretary while Hillary was secretary of state. This thru-line of personnel in and out of Clinton World is dangerous for most of the rest of us, because behind all the “talking heads” and genuinely amusing Saturday Night Live skits about this bizarre election lie certain crucial issues that will have to be dealt with: decisions about climate change, foreign wars, student-loan unaffordability, rising income inequality, declining social mobility, and, yes, the threat of another financial crisis. And keep in mind that such a future economic meltdown isn’t an absurdly long-shot possibility. Earlier this year, the Federal Reserve, the nation’s main bank regulator, and the Federal Deposit Insurance Corporation, the government entity that insures our bank deposits, collectively noted that seven of our biggest eight banks—Citigroup was the exception—still have inadequate emergency plans in the event of another financial crisis. Politicians regularly act one way publicly and another privately, as Hillary was “outed” for doing by WikiLeaks via its document dump from Clinton campaign manager John Podesta’s hacked e-mail account. Such realities should be treated as neither shockers nor smoking guns. Everybody postures. Everybody lies. Everybody’s two-faced in certain aspects of their lives. Politicians just make a career out of it. What’s problematic about Hillary’s public and private positions in the economic sphere, at least, isn’t their two-facedness but how of a piece they are. Yes, she warned the bankers to “cut it out! Quit foreclosing on homes! Quit engaging in these kinds of speculative behaviors!”—but that was no demonstration of strength in relation to the big banks. Her comments revealed no real understanding of their precise role in exacerbating a fixable subprime loan calamity and global financial crisis, nor did her finger-wagging mean anything to Wall Street. Between 2013 and 2015, she gave 12 speeches to Wall Street banks, private-equity firms, and other financial corporations, reaping a whopping $2,935,000 for them. In her 2016 presidential run, the securities and investment sector (aka Wall Street) has contributed the most of any industry to PACs supporting Hillary: $56.4 million. Yes, everybody needs to make a buck or a few million of them. This is America after all, but Hillary was a political figure paid by the same banks routinely getting slapped with criminal settlements by the Department of Justice. In addition, the Clinton Foundation counted as generous donors all four of the major Wall Street–based mega-banks. She was voracious when it came to such money, and tone-deaf when it came to the irony of it all. One of the more illuminating aspects of the Podesta e-mails was a series of communications that took place in the fall of 2015. That’s when Bernie Sanders was gaining traction for, among other things, his calls to break up the big banks and resurrect the Glass-Steagall Act of 1933. The Clinton administration’s dismantling of that act in 1999 had freed the big banks to use their depositors’ money as collateral for risky bets in the real-estate market and elsewhere, and so allowed them to become ever more engorged with questionable securities. On December 7, 2015, with her campaign well underway and worried about the Sanders challenge, the Clinton camp debuted a key Hillary op-ed, “How I’d Rein in Wall Street,” in The New York Times. This followed two months of e-mails and internal debate within her campaign over whether supporting the return of Glass-Steagall was politically palatable for her and whether not supporting it would antagonize Senator Elizabeth Warren. In the end, though Glass-Steagall was mentioned in passing in her op-ed, she chose not to endorse its return. Her entire characterization of how the 2007–08 banking crisis unfolded was, well… wrong. Here’s how traditional banks (like JPMorgan Chase) operated: They lent money to investment banks like Lehman Brothers so that they could buy more financial waste products stuffed with subprime mortgages that these traditional banks were, in turn, trying to sell. They then backed up those toxic financial products through insurance companies like AIG, which came close to collapse when what it was insuring became too toxically overwhelming to afford. AIG then got a $182 billion government bailout that also had the effect of bailing out those traditional banks (including Goldman Sachs and Morgan Stanley, which became “traditional” during the crisis). In this way, the whole vicious cycle started with the traditional banks that hold your deposits and at the same time could produce and sell those waste products thanks to the repeal of Glass-Steagall. So yes, the loss of that act caused the crisis and, in its wake, every big traditional bank was fined for crisis-related crimes. 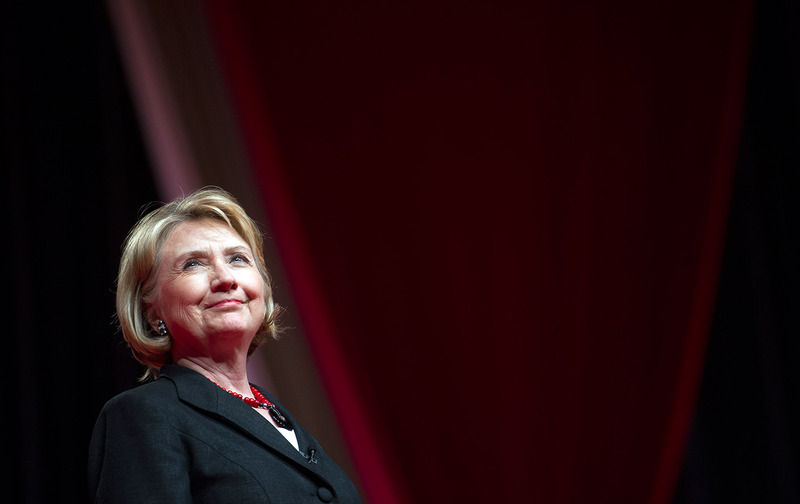 Hillary won’t push to bring back Glass-Steagall. Doing so would dismantle her husband’s legacy and that of the men he and she appointed to public office. Whatever cosmetic alterations may be in store, count on that act’s remaining an artifact of the past, since its resurrection would dismay the bankers who, over the past three decades, made the Clintons what they are. No wonder many diehard Sanders supporters remain disillusioned and skeptical—not to speak of the fact that their candidate featured dead last (39th) on a list of recommended vice-presidential candidates in the Podesta e-mails. That’s unfortunately how much his agenda is likely to matter to her in the Oval Office. Hillary also wrote, “If any bank can’t be managed effectively, it should be broken up.” But the question is: Why doesn’t ongoing criminal activity that threatens the rest of us correlate with ineffective management—or put another way, when was the last time you saw a major bank broken up? And don’t hold your breath for that to happen in a new Clinton administration either. Among the e-mails sent to John Podesta that were posted by WikiLeaks is an article I wrote for TomDispatch on the Clintons’ relationships with bankers. “She will not point fingers at her friends,” I said in that piece in May 2015. She will not chastise the people who pay her hundreds of thousands of dollars a pop to speak or the ones who have long shared the social circles in which she and her husband move.” I also suggested that she wouldn’t call out any CEO by name. To this day she hasn’t. I said that she would never be an advocate for Glass-Steagall. And she hasn’t been. What was true then will be no less true once she’s in the White House and no longer has to make gestures toward the platform on which Bernie ran and so can once again more openly embrace the bankers’ way of conducting business. To date, $10 trillion worth of assets sits on the books of the Big Six banks. Since 2008, these same banks have copped to more than $150 billion in fines for pre-crisis behavior that ranged on the spectrum of criminality from manipulating multiple public markets to outright fraud. Hillary Clinton has arguably taken money that would not have been so available if it weren’t for the ill-gotten gains those banks secured. In her usual measured way, albeit with some light admonishments, she has told them what they want to hear: that if they behave—something that in her dictionary of definitions involves little in the way of personalized pain or punishment—so will she.